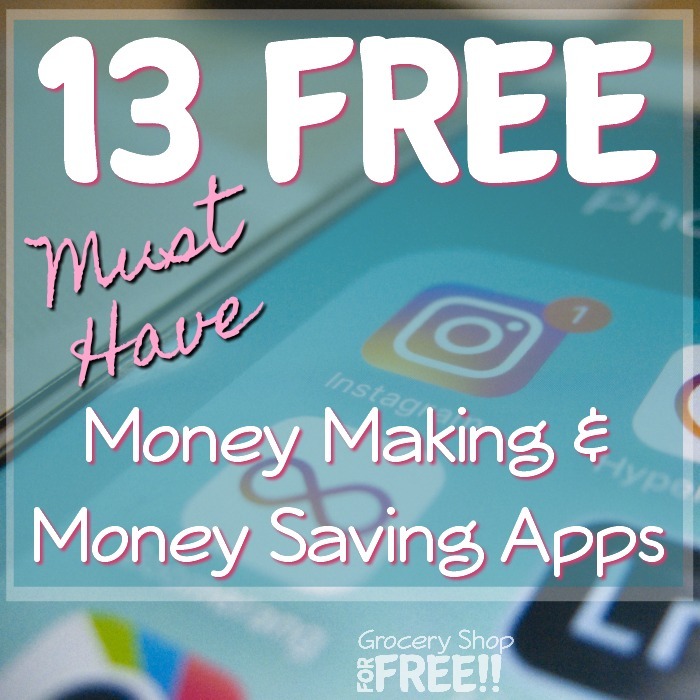 13 FREE Must Have Money Saving Apps! 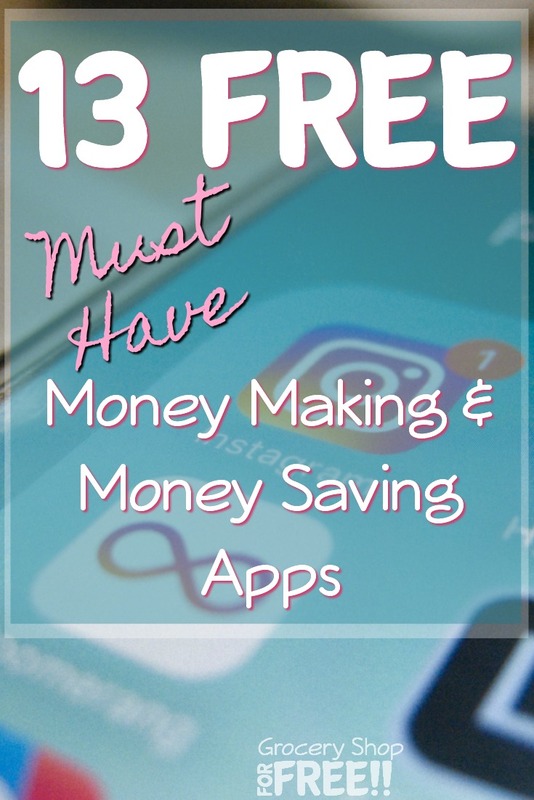 You are here: Home / Finance / Saving Money / 13 FREE Must Have Money Saving Apps! Here are 13 FREE Must Have Money Saving Apps! I have mentioned a few phone apps before. I really like using the coupon apps – they’re so easy to use and great to have right with you when you’re out! If you have never used an app for saving money while shopping before, then you are missing out! You can save so much with your smart phone/device! You can even MAKE some with these apps. All you do is read about the apps below and choose the ones you’d like to use. Click the link and you’ll be taken to the info to get it setup. Make sure you read the FAQ’s carefully, some of them require that you choose what you’ll be purchasing before you shop, so you need to do that for those, and some offers don’t allow you to use a coupon with the offer, so you’ll need to know those things. Basically you shop as normal and when you are putting your items away at home you’ll scan your receipt and maybe a bar code or two and then just wait for them to verify your purchases and then you get paid! Some pay immediately and some require $5 or $10 to be accumulated before they pay. You can also use them together so if two or three of the apps have an offer on the same item you can usually redeem all of them! Don’t wait any longer be sure to get these ready before your next shopping trip! I LOVE this one for saving & earning money! You can get money back on purchases at tons of grocery stores! You just download ibotta on your mobile device and choose the saving offers you want and then after you purchase them, just take a picture of your receipt and they deposit the money in your ibotta account! You can cash out once you get $20 in your account. You can get your money in Paypal or donate to any school in the U.S. or to the United Way! Checkout 51 can be used with Ibotta and Shopmium, too! I love that they can all be used together and sometimes you can double or triple your savings that way! With this one you get cash back from products you purchase at grocery or drug stores! Just download it on your mobile device, choose the offers you want and once you purchase them, you take a picture and upload it to get your money deposited in your account, once your account balance reaches $20, you can cash out and they will mail you a check! This is much like the others. It will work with others as a “stack”, so you can use it and Savingstar, and Ibotta, and Checkout51, etc.! This makes for even MORE FREE items and overage! You can shop at any store you like, upload your receipt, and request your money. There is no minimum with this one, you can request any amount of money you have in your account at anytime and it will be added to your Paypal account within 24 hours! This one is good for iOS and Android users. I love this one, all you have to do is scan your receipts and it gives you points toward gift cards. It will allow any receipt for anything. You can even connect it to your email and it will give you credit for any receipts you receive in your email. You can scan receipts you have already scanned into any of the other apps listed here, too. This one does all of the ad matching so you don’t have to at Walmart. It matches your receipt to all of your local stores and then gives you back the difference if they find it for less somewhere else! You can transfer your money to an egift card to be used in store or online at Walmart! This one offers specials on produce and even FREEbies on Fridays! You can purchase products they have offers for and you get the coupon amount given back to you in your account. This is another one you can use to save up your earnings for anytime of year! Just take pictures of your grocery receipts, and Receipt Hog will pay you. It’s that simple. And if you submit receipts regularly, you can earn spins at the “Hog Slots” slot machine, where you can win more money or even have your entire shopping trip paid for! It’s fun, easy, and free. This one is for all your healthy food! It is a cash-back mobile rebate app that gives you money back when you buy healthy foods that are organic, gluten-free, non-GMO, etc. This one I use all the time – it has coupons for me wherever I go! I can look at it before we choose a restaurant and find a great coupon or for entertainment or even discounts at retail stores! I love it! This one you all know – you get those blue packets of coupons and local offers in the mail. Well, now you can get and search for those local offers and more with this app! This one is great for making your lists! You can check out your local stores matchups and make your list on your mobile device and then email it to yourself to print the coupons! You can also search for the best price on any items at your local stores. I love that feature, so when i need something like Milk – I can search for the best deal on milk and then ad match that price at Walmart! How easy is that?! This one allows you to put all of your store rewards cards in it and you can just pull up the barcode for your cards on your phone and the cashier can scan it. It also works for library cards, your gym, even places like Famous Footwear. It has most of the popular stores already listed and you just scan your cards with a barcode scanner (see below)! Whether you’re at the grocery store, making your travel plans online, or visiting your local gym, don’t get caught without your membership cards again. Lighten your load and get rid of all that plastic baggage — scan your cards from your smartphone device with CardStar! This is handy! First of all you can use it to scan in all your cards for the app above. You can scan products in the store and get more info on them and even pricing at other stores! A lot of places now have QR codes which are black and white squares with a lot of small boxes in them that a barcode scanner can read and automatically take you to a specific websites embedded in the QR code! Don’t forget our app while you are downloading the ones above! You can make sure you never miss another deal! So, those are my top 13 favorite apps! How To Save Money. Simply. Every Day. Foursquare is an Android app that we love! You check in to certain places and some have specials just for checking in that you unlock. Murphy’s USA has $2.50 off of a $30 fill up Memorial Day weekend, also they have a free Red Strike energy drink (1 per day) withevery check in no strings attached, and we have got free chips & salsa at Chilis the other day! It works off of GPS and tells you what deals are in your area!! Very cool! What about saving star ? I have made / earned a lot of money with that one. SavingStar is another great one! Thanks! That’s another great one – thanks! Only one out of all of these aps are on the windows phones. I have a Nokia and want savings aps. I have an Android… I also have the first 8 apps… and use them frequently! like to coupon and save money. I downloaded the Shopmium app and it “located” me as in France! (Which I’m not!!) now the entire app is in French and the sales I see are for in Paris! (Which would be cool but totally not helpful!) any idea what went wrong?? And how to fix it!! So sorry – I don’t – I would contact their customer service to get that cleared up! Right now I’m only using Checkout 51, but I may need to use a few others to save some more money. I love the Cartwheel app by Target. Considering I can spend hours in there, its only right that I save money while doing it. What if you don’t have a smart phone. I have a kindle, and I only have a regular phone. I have 7 of the first 8 apps on my Android tablet, as well as my Android phone. Only MobiSave isn’t compatible. I don’t know if they will work on a Kindle, but it’s worth a shot! Good to know! I haven’t tried Mobisave on my tablet yet! JUST SIGNING UP. HOPE TO ENJOY AS MUCH AS I THINK I WILL. THANK YOU FOR ALLOWING ME IN!!! Try Yowza!! free on Android and IPhone. I love it no more coupon clipping! My newest payback app I discovered is Find&Save. You can earn a percentage of your receipt total with at least the minimum of what the payback requires. Typically 1-4% of the minimum. Some times a set amount. A great variety of stores too. Thanks, I’ll have to try it out! Has anyone used the Savingstar credit card? I was wondering how it worked. Thanks. I will try some of them out today. Thanks for all these great tips! Oh and FYI…Ibotta now cashes out at $20.00 . Thanks, and you’re welcome! I forgot to change that – thanks for the reminder. Awesome! Let me know if you have any questions! You’re very welcome! Let me know if you have any questions! I have an android phone, and no data plan. Can I still download all of these and make it work? I would love to….cause I love me some savings too! Hi there! I was curious as to where you’re located ( generally of course). I’ve tried mobisave and everything I scan says that it doesn’t qualify (I’m in the US. In Pennsylvania). Also checkout 51 was one of my favorite apps but they seem to be changing recently. Most of their rebates cannot be combined with coupons and other rebate apps. :( Total bummer. I’ve saved over 100$ with Ibotta in less than 3 months! It’s definitely my favorite now! Have you ever heard of fetch rewards? It’s like a cross between Ibotta and receipt hog. Scan receipt for grocery store, pharmacy or wholesale store and you get points back for every receipt. If you buy certain things you get more points. I am in Texas and some of the deals on the apps can be more location specific, as can some coupons. I would have to say Ibotta has always been my favorite. It’s just super simple.